Learn how to blog like the pro’s with Creating Content: A Blogger’s Blueprint! Real page from the fill-in-the-blank workbook. You’ve heard you should be blogging. You know you should be blogging. You just don’t have time to blog. Or perhaps, maybe you are blogging, but your blog is not doing IT, the IT you want your blog to do for your business. Maybe it’s a traffic problem. Maybe it’s an SEO problem. Maybe it”s a content problem. You want your blog to build your credibility as an authority. You want to blog on a regular basis, but you’re stuck. Stuck on what to write. Stuck on when to publish. Stuck because you’re too busy to blog. “Creating Content: A Blogger’s Blueprint” is your solution! Whether you’re new to blogging, or want to become a better, more organized blogger, this ebook is here to help! Fill-in-the-blank page from the workbook. What are the main types of blogs? Which publishing model is right for you? How do figure out what to blog about? Should you do all your own writing, or find contributors? What in the world is an editorial calendar, and why do you need one? How do you decide on categories? How do you make the right kind of images for your blog posts? BONUS AUDIO: Tips for Creating Powerful Headlines That Sell! 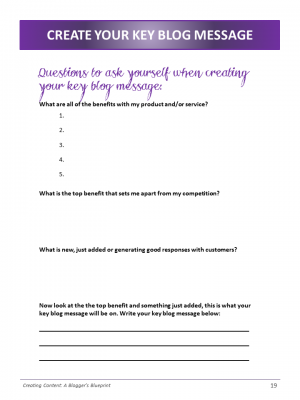 Craft your own blogging master plan! Figure out who you want to read your blog, and go find those readers! Decide on the best publishing model that will meet your goals. Blog every week, without hesitation or confusion. Build a community of subscribers who love your blog. Create your own 12-month editorial calendar in less than 60 minutes. 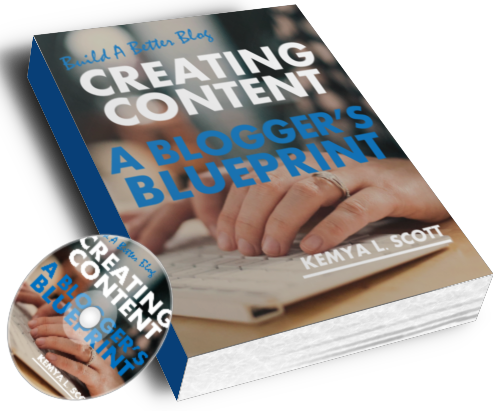 Get Your Copy of Creating Content: A Blogger’s Blueprint and build a better blog!